Last week, I wrote about how I had two great ideas for Valentine’s Day quilling tutorials. I started with the fringed heart – on the simpler side, but with a new technique. This week’s project is a bit more time consuming, but a real wow. We’re making quilling paper lace hearts! These paper hearts are based on the idea of detailed lace. There any number of ways you could do this since there are millions of lace patterns to inspire your quilling. My version has a lot of steps, but I love the finished result. First, print your template. I’m using the exact same heart that I used for last year’s Flowers and Vines heart. I used a ruler to make a line every 1/2″ on my heart, so the lace details would be spaced equally. Then, cover your template with wax paper and pin to a workboard. Now you’re ready to build your quilling paper lace heart. Most of this heart will need to be made with double-thickness quilling paper. If you’re using standard quilling paper, fold your strips in half, add a very thin line of glue down one side and press both sides together, making sure the entire strip is glued tight with no air bubbles. For photo examples of this technique, visit this quilled mitten tutorial. For this example, you’ll need a few double-thick strips; I think I had to make about six or so from extra long 24″ quilling paper strips. There will be more strips needed later on, so maybe set aside somewhere between 15 to 20 strips per lace heart, depending on how long your strips are. Once your strips have dried, start the outline of the heart, using pins as needed. I would recommend outlining one side of the heart shape, then the other. Now, its time to put those measurement lines to work! Starting at the top of the heart, glue one end of a double-thick strip to the outline. Be careful to line the end up right with one of the 1/2″ measurement lines. Let the glue dry for a bit, then loop the strip so it touches the next measurement line. Apply a dot of glue to keep this spot in place. I chose to use a few pins to keep the loop in shape as I went. Continue these loops all the way around the heart outline. After the glue for these loops has dried, its time to move on to the next layer of lace details. In the same way that the small loops were made, use double-thick strips to make larger loops. Starting at the bottom of the template, glue a strip in a way that will cover 2 small loops at a time. I think this heart is really starting to look pretty! Notice that the larger loops stop at the top of the heart. This isn’t a problem and will be blended into the final design. Next, add some line details in the big loops. …then two more on either side. Try using tweezers, and dipping the ends of these small bits into glue to get them into these tight spaces. The last elements of these quilling paper lace hearts are the small coils on the outside edges. To make these, roll quilling paper strips that are 2″ long into a tight circle. Attach one to the middle of each large loop. Make more tight coils from strips that are only about 1″ long, and attach them to the rest of the outer edge. Here’s a close up of the top of the lace heart. You can see that I chose to only use the smaller 1″ coils, and it all just blends together nicely! The end result is so delicate and lovely! 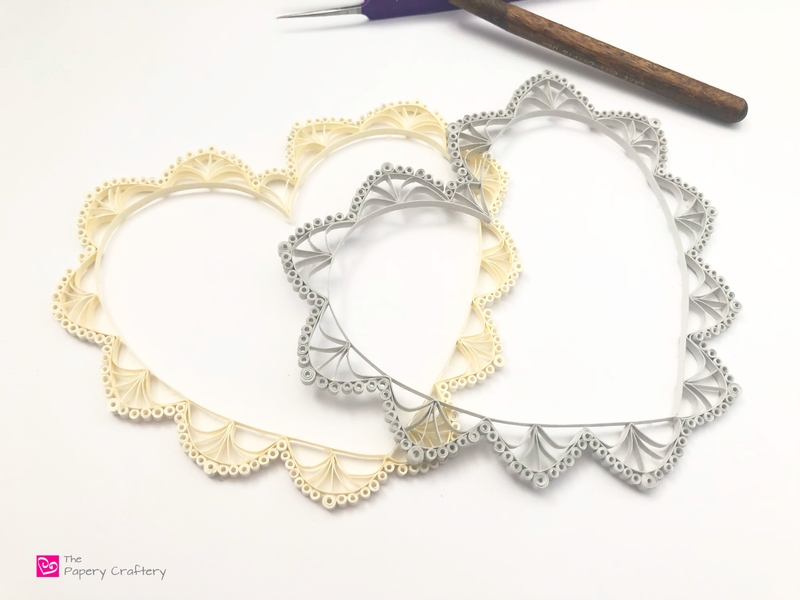 These lace hearts can be made in any color, but I love the soft tones like ivory or pale gray so they look a little antique. The details in these quilling paper lace hearts are totally customizable, too. Check out some photos of lace to get some inspiration, then the sky’s the limit! How will you use your lace heart? In a frame or a card, maybe? I might layer one of mine over a photo of my Valentine! Tell me your ideas in the comments below! Wow! These hearts are so beautiful.